From a pilot housing project and new internship and career opportunities to a summer transition program and personalized help applying for admission, the campus is stepping up its efforts to help transfer students make a smoother transition to UC Berkeley from community college. 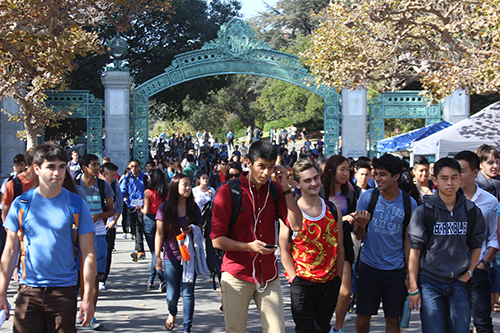 Currently, there are 6,406 transfer students at Berkeley — 21 percent of Berkeley’s 30,574 undergraduates. Of the new transfers who arrived last fall, 82 percent were California residents, 25 percent were from underrepresented minorities and 27 percent were first-generation college students. To qualify, students must have plans to apply to Berkeley in the near future, hold a minimum 3.0 GPA and agree to fully engage and participate in Starting Point. Mentors must enroll in a two-unit course that meets twice a week for one semester and familiarizes them with college and department policies. The biggest advantage Starting Point provides to potential transfer students is the rare opportunity to meet with an admissions officer, either in person or over the phone, and to receive critical feedback about their applications before submission. This academic year, a pilot project partnership between RSSP, the Transfer Student Center and the ASUC created housing exclusively for transfer students. The Transfer Living and Learning Community was an initiative advocated by ASUC Senator Carmel Gutherz and provides 45 transfer students with their own floor in the Maximino Martinez Commons on Channing Way. After hearing the need at a fireside chat, Chancellor Carol Christ gave the go-ahead and, along with Gutherz, staff in Residential Education, Housing Assignments and the Transfer Center planned and coordinated the implementation of this effort. Gutherz and Valdez reviewed transfer student housing applications in July 2017 and selected the first cohort for the community. Part of living there requires attending “Education 198,” a popular one-unit course taught by Valdez, academic counselor Andrew Henry and other campus advisers. It introduces transfer students to physical and online resources on campus and helps ease students’ entry to a fast-paced research university. Although 16 sections of the course are open to all transfer students, those living in the Transfer Living and Learning Community are all in the same section, where they engage in group work and discussions. “Education 198” also teaches effective study tips and networking skills to prepare transfer students for the demands of upper-division classes and connecting with professors. Other topics include time management and effective writing and communication. At GBO last summer, while freshmen enjoyed San Francisco tourist sites, about 1,000 transfer students visited Bay Area companies to learn about job opportunities and network with professionals. The nearly 50 companies, some run by alumni, spanned many fields, including technical, government, non-profit work and theater. Under Armour, Levi Strauss & Co., Bank of the West, the U.S. Department of Energy and the San Francisco mayor’s office were among those that welcomed the transfer students. This networking opportunity for transfers is unique among Berkeley’s peer institutions, says Roth-Francis. GBO leaders also organized an alumni mixer on Memorial Glade, where approximately 1,500 transfer students met 88 Berkeley alumni eager to give career advice and provide mentoring. Additionally, stops on the transfer student campus tours included the Transfer Student Center, Alumni House and the Career Center. Cal to Career Connections, a GBO workshop, taught new transfer students about the power of networking. And the Career Center has seen a general upward trend in the number of transfer students seeking help with resume building and job hunting. Roth-Francis hopes to have former GBO participants as leaders for next fall’s orientation, since they can best help and guide transfer student groups. She also wants to expand the alumni mixer and company visits so eventually there will be opportunities that suit every transfer student’s interest. Another new pilot is the Transfer Transition Program (TTP), offered for six weeks during the summer in the form of Ethnic Studies 194B to incoming transfer students who want to explore research opportunities. Taught by Luisa Giulianetti, from the Centers for Educational Equity and Excellence, the class helps students develop ideas for research projects that would require funding or professional mentorship. “Students develop an understanding of and facility with discipline-specific conventions, language and approaches, as well as a strengthening of their identities as scholars and researchers,” Giulianetti says.